When you critically go through your CV, do you honestly feel it sells you like the professional you are? If not, then that may be a possible reason why you have been applying for numerous jobs with no call backs from Kenyan employers. Whether you are looking to change jobs or simply look for a job that matches your passion and profession, your CV is your marketing tool. Your CV is the very first piece of information any Kenyan employer will look at before inviting you for an interview. 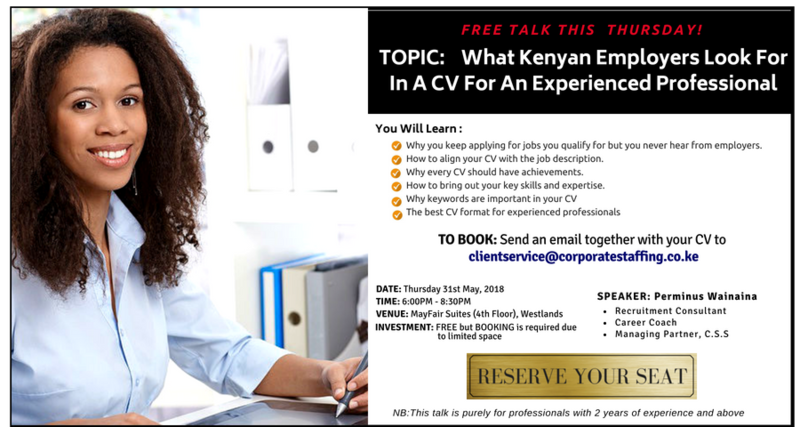 If you are serious about FINALLY getting to discover what Kenyan employers are looking for in a CV for an experienced professional like yourself, then join us this coming Thursday 31st May for this FREE TALK starting at 6:00pm in our offices in Westlands, Mayfair Suites – 4th floor. This FREE, practical and engaging talk will be facilitated by our Corporate Trainer, Executive Lead Career Coach, & Corporate Staffing Services C.E.O, Perminus Wainaina. Perminus has trained and coached over 300 professionals helping them gain self-awareness, clarify goals, achieve their development objectives, face their fears and unlock their potential. 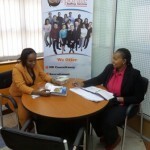 For employers, he has consulted for firms such as OX-FAM, UN Women, Action Aid, Windsor Golf Club, Nivea, Weetabix, Muthaiga Country Club, Car & General etc. In the last 8 years he has interviewed over 2,000 senior professionals looking to transition to a leadership role. He therefore understands the workings, demands and expectations of the corporate world. This is a FREE talk but booking is required. To book your seat NOW email us your CV with the subject line “FREE CV WRITING TALK” to clientservice@corporatestaffing.co.ke. Please note that due to the demand and interest for this talk, booking is on a first come first served basis so send us your CV NOW!